KeyLink by BuildingLink®: the complete electronic key security solution. The system you are using… sort of works, but maybe it’s too messy, or maybe it takes too long to find keys in an emergency, or to know which keys are missing and who took them last. 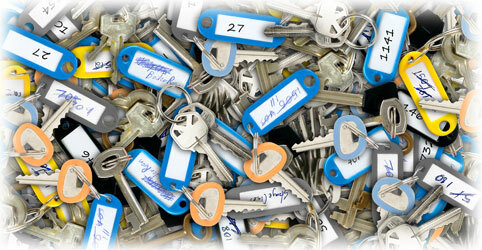 Maybe you are tired of the expense of replacing locks when keys are lost. Or maybe it’s just not secure enough. You just can’t dismiss that nagging, uneasy feeling that someone late at night may have quietly taken a key without authorization and used it for illegal entry. The KeyLink system is the result of three years of creative exploration, research, intensive design, and top-notch engineering work by the creators of BuildingLink.com, the ultimate integrated platform for residential property managers and their communities. 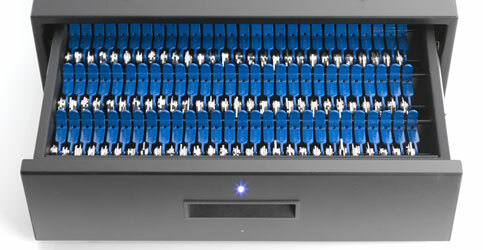 KeyLink is designed to organize your sets of keys, prevent unauthorized access, and provide a fully-documented audit trail of all key activity. Locking metal key drawers accessible only to authorized employees. Two basic drawer sizes (224-slot and 140-slot) which can be connected in any combination to meet requirements. Authentication options for Authorized Employees include biometric login (fingerprint scan), keyfob with pin, or BuildingLink login. Keytags are unmarked and identified only by an electronic chip on each tag. Key removal requests trigger illumination of the drawer LED and blinking of the keytag LED. Keys can be returned to any slot in any drawer. Complete logging of all system activity, including employee access or failed access, key registrations, key removals and returns. ...but then we totally leapfrogged the competition! Better Size Options - A better "small drawer" option (20" deep, that fits on/under most normal counter tops) that supports 140 slots, versus only 96 slots in other systems. Better Software-Update Methods - “ClickOnce” technology keeps your KeyLink software always up-to-date, by automatically detecting and effortlessly installing all new program releases via the Internet. Your users get immediate access to any new program functionality, and your IT staff permanently eliminates the need for any software maintenance work. Better Documentation of Chain-of-Custody – Employees removing keys from drawers can definitively document to whom a removed key has been given (and who has been let into an apartment), via optional integrated webcam photo capture, signature capture pad or driver's license scanner (Coming soon). Better Way to Open Drawers in Event of Computer Crash - Emergency Override Keyfob talks directly to the drawers' firmware/(internal microcomputer), so in the event of a computer crash the administrator can still "pop open" a drawer from the front, without having to pull the drawers out of their cabinets to access the manual key in the back. Better Accessibility to Important Keys in case of a Building Emergency - Immediate access is provided on the main dashboard to all the keys you have identified as your own Emergency Keys. Better Customization Options – Many configurable settings are user-controllable, such as adjusting the smart key-return algorithm, setting the allowed key-out intervals and even setting the pitch and delay of the “drawer open” buzzer. Better and Stronger Keytag and Rivet Assembly – Ergonomically-optimized keytags with pull-tab and light diffusion dome for easy gripping and locating. Custom-machined and stepped rivet sleeves for easy and durable riveting of new keys to Keytags. Better Support for Multiple-system Installs – Internet-enabled System-communication protocol tracks identities and locations of keys across all systems. Better Data Integration Options – Total and seamless BuildingLink or KeyLink WebAccess integration synchronizes everything happening on your system with your online searchable database (including resident names and apartments, employee permissions, locations of all keys, photos of key recipients, alerts, detailed activity for each drawer, employee and key). No more double entry, no more need to “visit” the system in person to find out what’s going on. Better “Touch” User Interface - Touchscreen-friendly intuitive design makes the system easy to teach, learn and use, when used with the included touchscreen all-in-one PC. Better Engineering – Memory Buffer records off-line events. Use of industry-standard USB connectivity and modular design allow easy component replacement or upgrade. Better Styling - Sleek rows of euro-designed electronic keytags keep messy clusters of keys tucked neatly out of sight. Flashing neon-blue LED keytag-location indicators, and beep patterns create for users and residents a sophisticated and modern aesthetic. Better Data Backup and Remote Monitoring – Real-time backup to password-protected local USB key, and online Internet backup of all key removals, returns, and registrations protect you effortlessly against data loss. Remote hourly heartbeat monitoring of each system by KeyLink support staff identifies system problems as they occur. Better Remote Configuration Tools - KeyLink WebAccess lets managers assign employee permissions, configure notifications, and search key activity logs remotely via any web browser. Better Handling of Temporary Keys – Keys being left for only a short time can be tracked and quickly found via the “Temporary Keys” button and functionality. Better Email Notification Options - A range of resident and staff email notification options (i.e. upon key removal and return, end-of-day report of keys out, etc.) keep you informed of important events. Better Tracking of Overdue Keys – Default “Due Back By” intervals can be specified for each removal reason (i.e. dog-walker, contractor), and dashboard alerts on overdue keys let you maintain tight control over circulating keys.